Today was lesson three of the Partridge Christmas Stocking Mystery Class. Woo Hoo we are over halfway finished! Not bad for just days after Christmas. Today’s lesson allowed us to finish the tree and stitch the leaves. 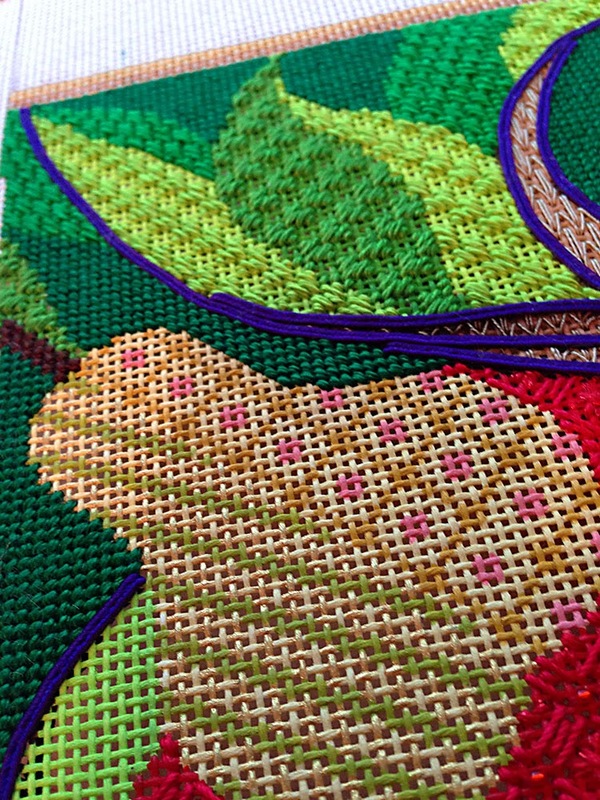 I am only stitching days, sometimes hours ahead of those of you who are in the class. Most of the time that works. Sundays are class days from 1-3 at the shop. After class and after whatever else the day throws at me I sit down to write the blog. (That’s now.) I also post the photos on my page on Stitcherie.com. Next up is thinking about what we will stitch in the next lesson. I need to divide the canvas into equal parts so that that we don’t run out of time or finish early. Yeah, right. Typically I already have a plan in my head of what’s coming next. Stitching is next. Monday and Tuesday are my days for test driving the stitches. I start the areas we will stitch in the next lesson and guess-timate how much thread we will need. YIKES! It’s Wednesday, I need to order the threads for class. Sometimes it’s Thursday when I order, but that really is the end of the road if the threads will be here on time. Throughout the next week I stitch what I am planning for class. I typically stitch in front of my computer. Pretty exotic isn’t it? I chart each section as I stitch it. I write the words as I stitch. That tends to keep me in line. Once in awhile I get off track and I don’t take the time to write the instructions, create the diagrams while I am stitching. There’s just too much to do. Sometimes I don’t finish stitching the lesson either. That’s a blog post for another day. Lesson three was one of those times when my stitching got ahead of the instructions. This means you have options! See, there’s always a silver lining. When I charted the last leaves to be stitched I thought I was charting what I stitched. Not quite. The chart in the instructions is actually different from what I stitched. So now we have two variations of the stitch for the archives. 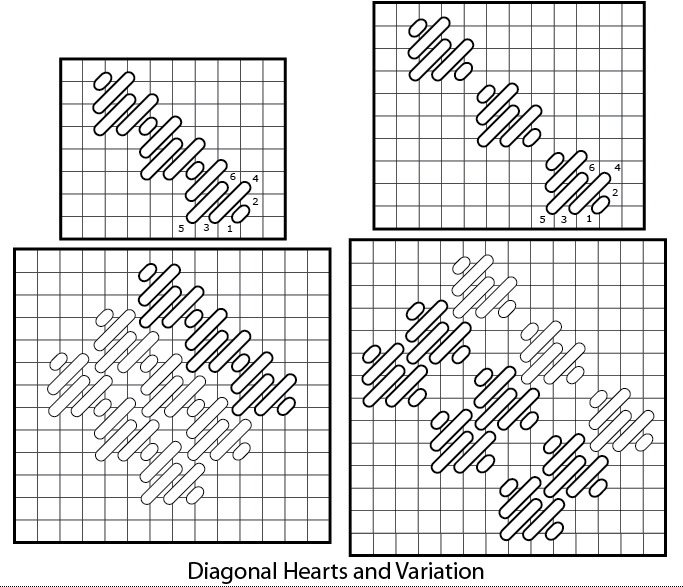 The diagram at left is the Diagonal Hearts as shown in the instructions for the Partridge Stocking. The second diagram is what I actually stitched. You can select the one you prefer or use them both together. 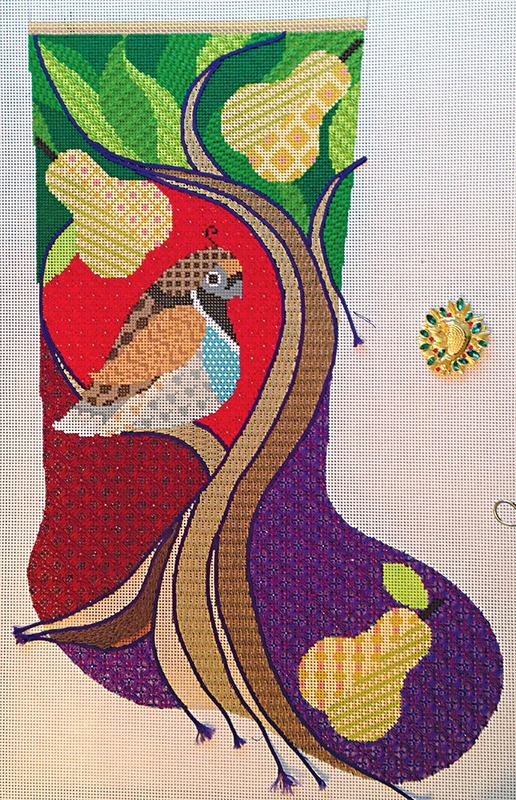 There are 3 different stitches used in the leaves, one is Basketweave. 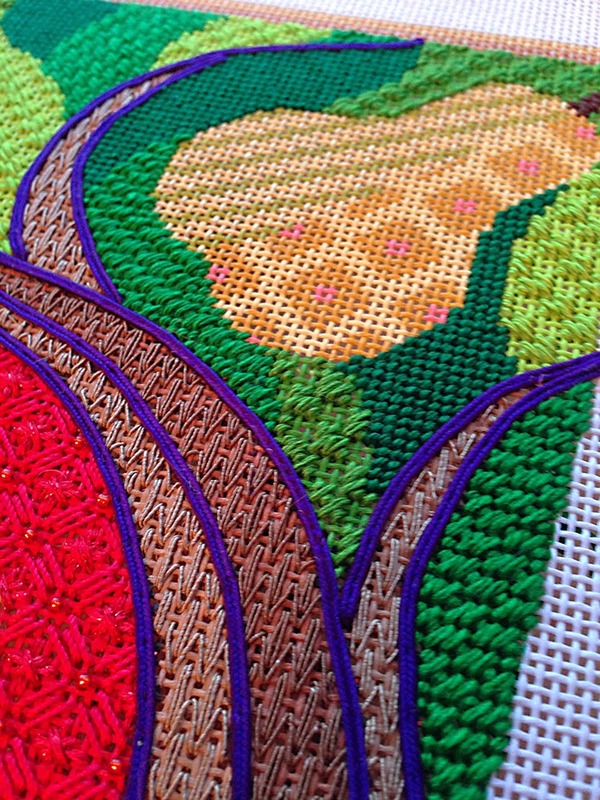 Each of the three stitches is worked in its usual orientation and again with the canvas turned 1/4 turn creating 6 variations of stitches for the leaves. Remember I said that sometimes I don’t finish stitching in time for class. This was one of those times. The tree wasn’t completely finished for it’s photo shoot. We’re almost there now and it’s time to start planning lesson #4! I better get busy. Thanks so much Ruth. I always thought I was the only person calling Rainbow Gallery on Wednesday and praying for fibers to be delivered for the weekend!